One of my favorite things about the Dandelion School is that it’s covered in murals and mosaics designed by students. Without the artwork, the school would be a drab collection of cement buildings surrounding a cement courtyard. 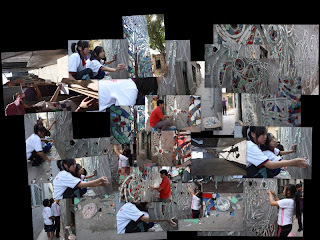 This week, artist Lily Yeh was at the school continuing her work with the Dandelion students on tile and mirror mosaics in a narrow path that leads to the library and more classrooms at the back of the school. She has helped the students transform the school into a work of art and has worked with them to write about their journeys through China and about their hometowns.